Fun fact, in middle school my hair used to be completely FRIED. I would straighten it every single day and didn’t take care of it at all – one of my friends even commented that it “looked like straw” (which hurt my feelings). Anyway, fast forward several years of taking really good care of my hair, and I was able to transform it from looking like “straw” to healthy and voluminous (while still using heat products on my hair). So take my hair as the example that it IS possible to regain healthy hair once you think you’ve damaged it! I’ve compiled a few of your questions from Instagram and emails and am answering them below. If you have some additional questions, please leave them in the comment section below and I’ll get back to you! A: I only wash it once or twice a week! I try to get away with going as long as I can in between washes (I take a lot of baths with my hair pulled up in a bun :). Not shampooing your hair every day is actually really good for your hair – there are a lot of natural oils in your hair that make it healthier and shinier, and shampooing strips your hair of these oils. I typically wash mine at the beginning of the week… once I blow dry and curl it, I won’t have to do anything to it for a few days. Sometimes I touch up the curls with my curling wand if I’m taking photos, but thats it. I also rely on dry shampoo a lot in between washings. The one I’m really loving right now is this one – it’s powder based (rather than aerosol) and is small enough to fit in your purse or carry-on so it’s easy to take with you on-the-go! Q: What’s your shower routine like? A: This may be a little weird, I do have a pretty strict shower routine, haha! I apply shampoo first and shave my armpits while the shampoo is on my hair, then I rinse out the shampoo and apply conditioner just to the ends of my hair. I am careful to avoid my roots because this makes them more oily! While the conditioner is on my hair I’ll shave my legs, lather up with body wash and then gently comb the conditioner through my hair with this two-sided comb (I use the larger side). This gives the conditioner plenty of time to really soak into my hair! When I’ve gotten all the tangles out with my comb, I’ll rinse off for a final time and get out of the shower. I immediately use this super absorbent towel to dry my hair off and wrap it around my head. 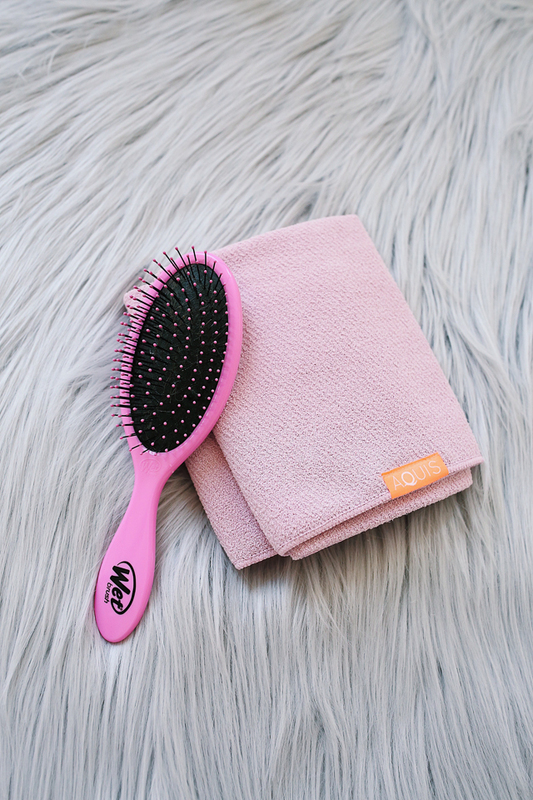 This particular towel protects your hair’s natural integrity while also cutting drying time in half (plus it’s cute and pink!). 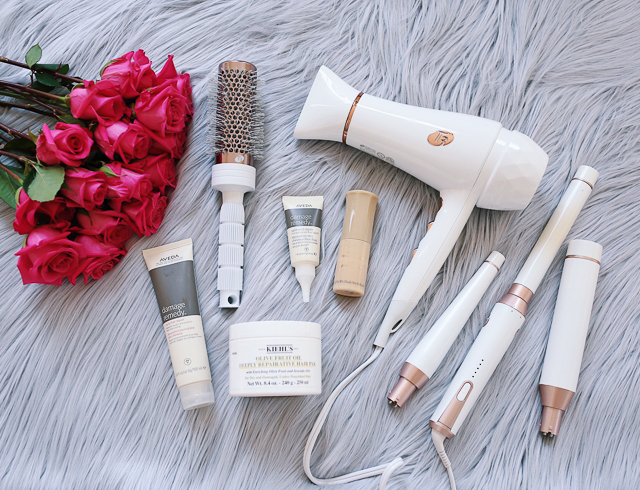 Q: What heat products do you use to blow dry, straighten, and curl your hair? A: To blow dry, I use this hair dryer. It’s extraordinarily powerful and dries my hair much faster than other dryers. It has two speeds and three different heat settings (I use the middle heat setting). I don’t straighten my hair very often but I when I do, I use this straightener – it’s amazing. And finally, to curl my hair I use this curling wand with the 1″ attachment. 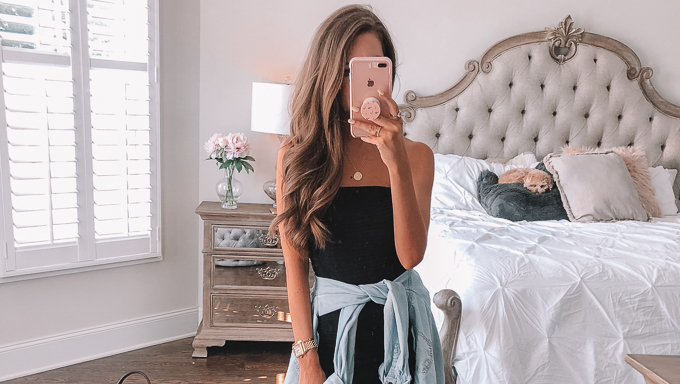 I have talked about this curling wand so many times – it is an investment, but the best wand I’ve ever used. Q: Is your curling wand really THAT good? A: You would be surprised how much I hear this question, but the answer is YES! It’s the real deal, y’all! I’ve convinced several of my friends to get it and they swear that they will never use another curling wand again. I have no idea why it works so well, but it does. The curls last for multiple days! Q: What curling iron and hair dryer did you use overseas? I’m not sure what to get since the outlets are different and voltage can fry a normal one from the States, even with a converter. A: The trick to using heat products overseas is making sure that they’re dual voltage! My curling wand is dual voltage, and all I needed was an adapter to plug it into the outlets in Italy. I had zero problems with it the entire two weeks and it curled my hair perfectly! As for the hair dryer, I own the travel sized version of my normal hair dryer – it is also dual voltage and works with an adapter. It’s incredibly powerful for it’s size and I love that it folds up to become even more compact. I bring both the travel hair dryer and curling wand with me on every single trip I go on. Q: How do your curl your hair? A: I actually filmed a YouTube video a loooong time ago! I’m kind of awkward in front of the camera haha, but the video can be found here. A good tip I go by: always curl the strands of hair away from your face! Q: Do you still straighten the roots of your hair before you curl it? A: No, I don’t! I used to do this, but realized that I was unnecessarily using a lot of heat on my hair that I didn’t need to. Now I blow dry my hair straight and then use the curling wand only on the ends. It actually gives my roots more volume this way, since I’m not flattening my hair with the straightening iron. Q: Can you recommend a good deep conditioner? A: Yes! After trying out DOZENS of deep conditioners this summer try to find the best one, I think I’ve found it! I’m OBSESSED with this one – it’s from a trusted brand, and you only need a small amount (even for long hair) to make it feel soft, shiny and manageable. It’s been a miracle worker this summer since my hair has been exposed to the sun and the harsh chemicals in pool water. Once every other week I’ll substitute this one for my normal conditioner and it leaves it feeling healthier than ever. Q: Do you use a heat protector on your hair before drying and curling it? 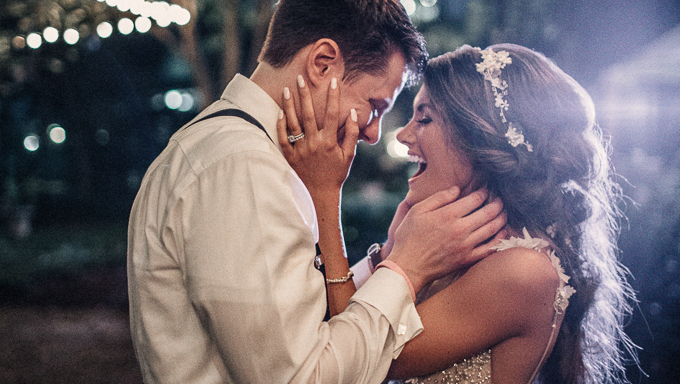 A: I do! Remember when I had fried hair in middle school? I NEVER used heat protector, and learned my lesson. I have raved about this product before and I still use it before blow drying my hair. 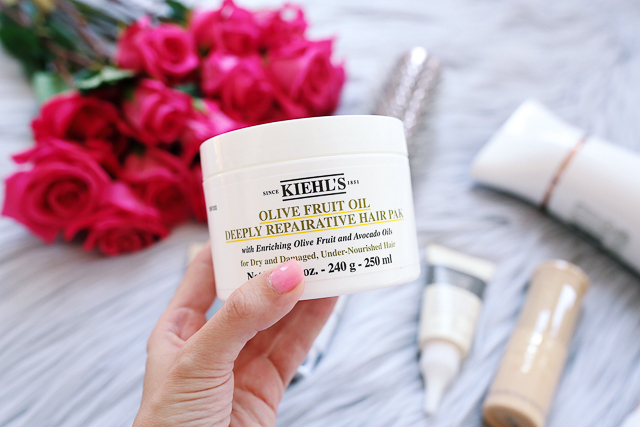 I also recently discovered this split end repair and it is a new holy grail product – it’s hard to avoid split ends when your hair is long and this stuff really helps! I apply it to the ends of my hair once I’m done blow drying and before I curl it. Q: I was just wondering how you get volume in your hair? I have about the same length as yours and I always have trouble getting volume because my hair is so heavy. A: This volumizing product has been my secret weapon over the past couple of months! A bunch of you noticed that I had a little extra volume recently, haha, and it’s all this product! I never would have thought that a powder could deliver so much volume, texture and holding powder, but this product proved me wrong. 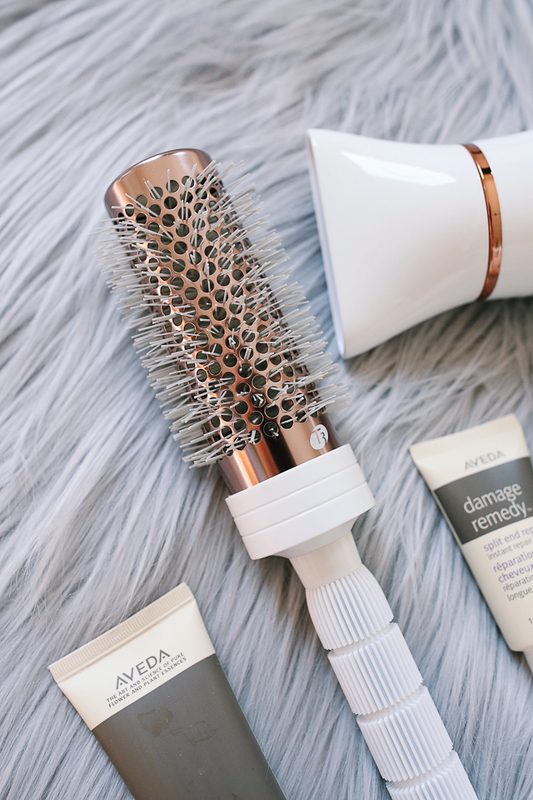 The pump diffuses a light-as-air powder that creates height without any weight or oil – it doubles as a dry shampoo by also absorbing excess oil on the scalp. Simply point and shoot where you’d like to add body and enhance texture – I like to apply it just to my roots. It’s truly a miracle product for volume! Q: Do you wear hair extensions? A: Nope! I don’t wear hair extensions and never have. Q: Any tips for growing out your hair? A: Taking care of your body by exercising and eating the right foods is actually the best way to make your hair grow… Make sure you’re getting enough protein and vitamins in your diet. Also – they say you’re supposed to get a trim every six weeks, but I totally don’t follow that rule. Don’t get a trim unless you need one, otherwise you’re just preventing your hair from getting longer! Q. How you do you keep your hair as it is when you work out? When I work out I have to put my hair in a ponytail and then it gets all over the place. I would love to wash my hair less but the whole working out thing ruins it. A: I go to Pure Barre for workouts 2-3 times per week and I just braid my hair while I’m there (it’s a lot less “stressful” on your hair than putting it in a ponytail). The workout consists of really small, isolated movements and is really hard but I’m never sweating that much, so it saves me from having to wash my hair. I use dry shampoo afterwards. Like I said above, if you have an additional question let me know in the comment section and I’ll respond there! I definitely need to hook myself up with some dry shampoo and stop washing my hair so often! I'll end up killing it! This is helpful! I have thick hair so I am always looking for things to cut the time when drying my hair. Checking out the hair dryer and that towel! 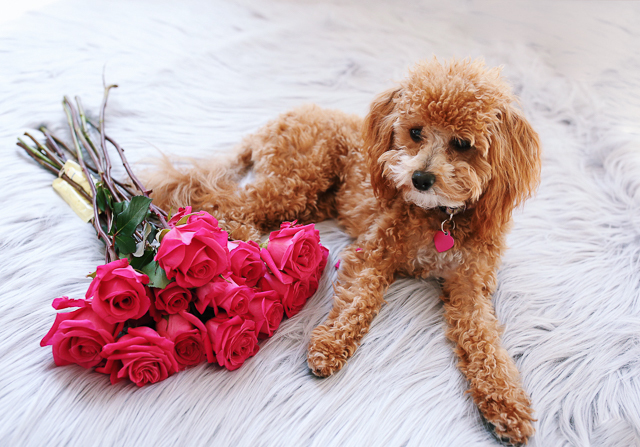 The wet brush is the BEST for naturally curly hair. Now they have one for thick hair and it's perfect for my hair since it doesn't tug on the hair as much. My hair is not okay with fewer washes! I find the blonder you are, the 'greasier' your hair looks. This is all helpful info though- I drool over your hair quite often. What a great post! I'm always interested in how you take care of your hair. I wash my hair 3-4x a week but feel like dry shampoo makes it so brittle! Any suggestions? Going to try your shampoo/conditioner to see if that helps! 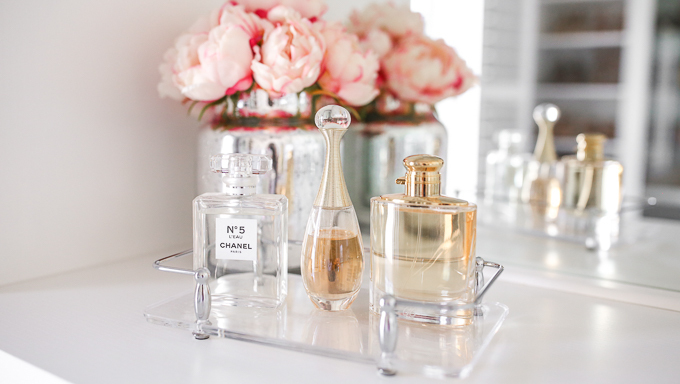 I have the exact same shower routine – so funny! Great post. I'll have to try the dry shampoo. I love that it is sulfate and silicone free. I have curly hair and avoid those ingredients. 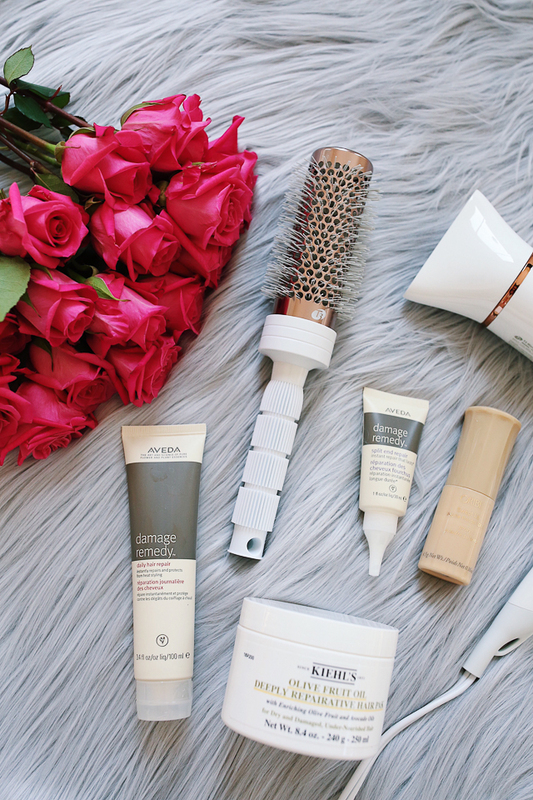 Thank you for sharing this post, absolutely loved looking through all the product recommendations! Your hair is GORGEOUS! I have thick hair as well, so I totally understand the struggles. Your hair is always gorgeous! I have long hair like yours but mine is naturally straight. I love curling my hair but I'm always afraid of damaing it-I'm prone to split ends! I think I will try some of those products you mentioned! Thanks for sharing your tips! I have long hair as well so I will have to check out these products you suggested! I would LOVE to get this curling wand, especially if you say it makes your curls last longer! 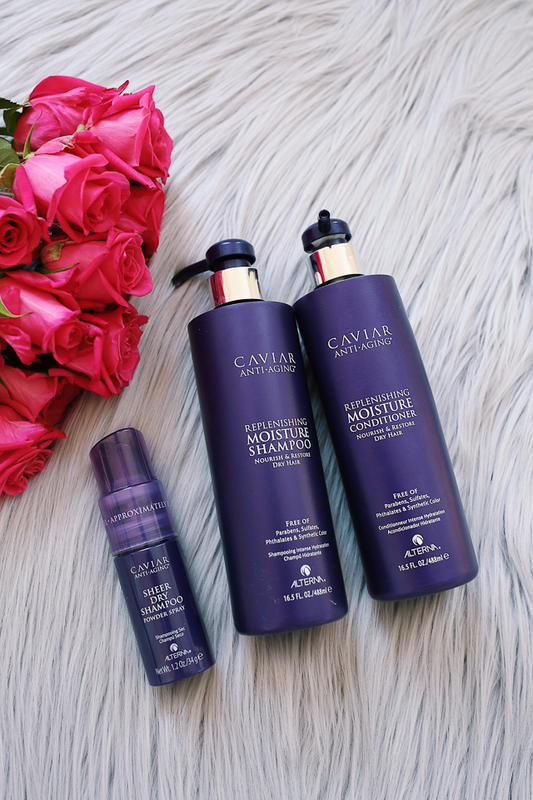 The caviar products are amazing!!! Things for the tips! Your hair is absolutely gorgeous! I'm curious – we seem to have a lot of humidity here in Texas … how does humidity affect your hair? Does it make it go straight or curly/frizzy? Just wondering to see if I think the curling wand would work for me. Also, how do you sleep with your hair at night? Mine gets greasy at the temples since it's natural and not color treated – wonder how you keep your curls in overnight. Thank you for sharing with us! The T3 hair dryer is at Costco right now priced at 89.99. Trying out this mask asap!! Thanks Caitlin! Aside from the great post, your images are perfection itself. I love all of these, your hair is amazing! How do you protect your curls overnight? My hair either gets super tangled and frizzy or if I pull it back I get a ring from my hair tie. What is a comfortable way to sleep while protecting the curls you worked so hard on? So many cute outfits for fall!! I already purchased the B.P. Heather grey bell sleeve top and Topshop Sweater! I absolutely love this sale and your style is the perfect guide to help me get my Fall/Winter wordrobe!! Love your pics! Can't wait to get mine! 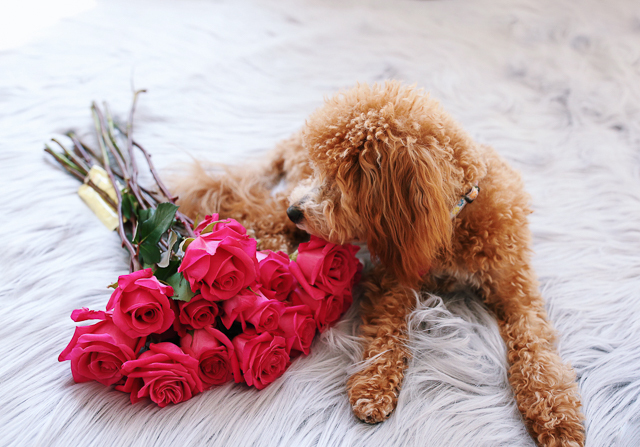 Love your content and your blog. Definitely gonna snug some cardigan. Love your style and as usual you wear the clothes so good. Thanks for the ideas. 😘😘😘😘 your definitely one of the fashionable people I follow. LOVE that green olive purse. I hope I win so I can buy it. Love your Style. 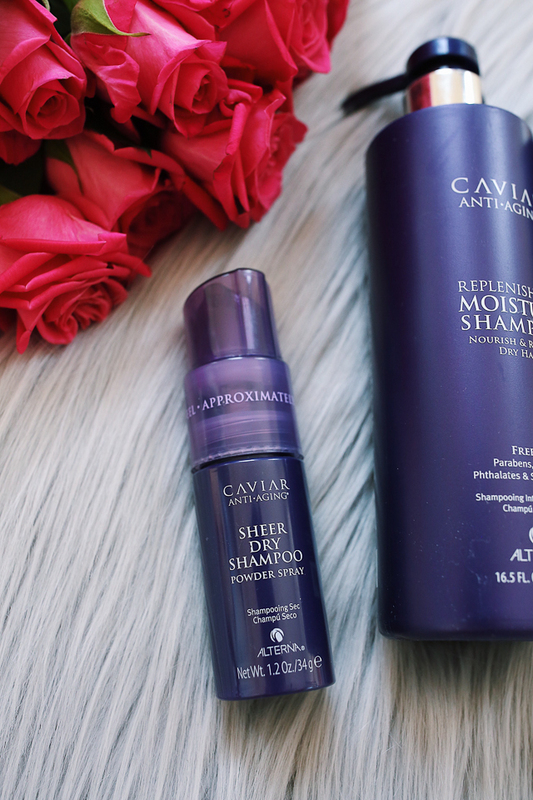 I noticed the Alterna Cavier shampoo and conditioner are much cheaper on Amazon. Do you know if there would be a difference in quality ordering from Amazon? Thank you for sharing all your tips. Your hair look absolutely amazing. Love all of these, especially those boots! The shampoo and conditioner is on the Nordstrom Anniversary sale!!!! Bought it yesterday! How do you preserve your curls overnight? do you wrap your hair up or tie it back? Yay thanks so much! This post is perfect! Thank you for showing me how to express myself with my clothing. My outfit defines my mood for the day! I always like to read about what others do to keep their hair healthy. Great post! Gorgeous hair! I think a fantastic cut lets you go longer between trims. What do you ask the stylist for when getting a cut or trim? Can you do a post with your hair straight and back view? Do you still use Moroccan Oil in your hair?? MOroccan oil is so bad for your hair! Google “Moroccan oil bad for your hair” and you’ll see what I mean! My hair getting so much oily with a two days. So I need to shampooing after thrice in a week or more sometimes. For that can I use Dry shampoo? Or Is it damage my hair more or not?Please help me. Thanks in advance. What do you do about sleeping to keep your hair looking good between washes? I would love to go longer between washes but my hair winds up looking like the wild west in the morning and no amount of styling helps it. I’ve tried a loose braid and silk pillow cover. Any tips? You mentioned that you do barre workouts now, but what did you do about your hair when you did BBG? I’m in good shape and yet can’t get through one of those workouts without getting drenched in sweat, including my scalp. I’m still doing BBG! I am the same way… I only do BBG on days where my hair doesn’t have to look good – haha. I usually braid it and then have some sort of headband on to prevent my hair from falling forward into my face.